Sugar Free Red Pasta Sauce Recipe! Before my wife and I cut out the sugar from our diet, spaghetti night was always a staple in our weekly meal plan. We always just browned some hamburger meat, threw in a jar of Ragu and spooned it all over spaghetti noddles. It took minutes to make and everyone loved it. But now that we were getting rid of all the processed carbs and sugars, we knew that the spaghetti had to go so we invested in a little kitchen tool that turns zucchini into thin strips that do a reasonable job of passing for spaghetti. So imagine our dismay when we head to the store to get some sauce to go over our noodles when we realize our old friend Ragu was full of sugar. No big deal, there are dozens of sauces on the store so we moved down to the Prego and discovered the same thing. Then Hunt’s, then Barilla, then Bertolli and so on until we finally had to come to grips with the fact that virtually all the red pasta sauces on the shelf contained added sugar. Fortunately, we had a family recipe for Spaghetti Sauce that Dian would cook all day in the Crockpot but I really needed something a lot faster. Something that could go from raw ingredients to finished product in about 20 minutes so that was what I set out to discover. 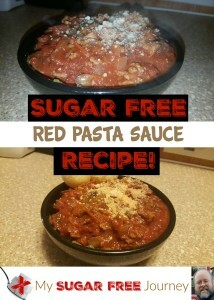 This Sugar Free Red Pasta Sauce Recipe is what I’ve come up with. Nothing revolutionary, just simple ingredients that taste great when combined. I hope it serves your family as well as it has mine. I usually serve this over spaghetti squash now instead of the zucchini noodles so I’ve included the “How to Cook Spaghetti Squash” video below. Please remember to subscribe to the YouTube channel or my daily email to never miss a recipe and if you like this and make it for your family, send me a pic and let me know how it went! Thanks. NEXT POST Next post: 2/24 Weightloss Wednesday: Things are Continuing! Pingback: Roasted Radishes and Lemon Greens Recipe! Did you not know there is a lot of sugar in tomatoes? This recipe is useless for low-sugar eating. Of course but if you are going to make a red pasta sauce, this is a good option. If you are trying to cut out all carbs then you are cutting out almost all veggies. Some people don’t want to do that, they just want the best options available for whatever meal they are trying to make. So happy to find this recipe. We’re doing an elimina diet for a few weeks and this is a life saver! This was delicious! I used garlic granules since I ran out of minced garlic. I also added diced green bell pepper. Cant wait to make it again. Definitely keeping this recipe. So glad you found it! It’s quick and easy and it has been a staple in our house for years!